I love sharing my love of "local" during the holiday season. Here are my top gift ideas for 2011. I do like a nice gift basket. 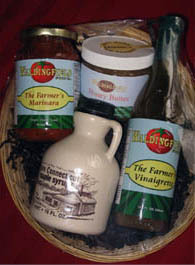 This year I saw that Waldingfield Farm has a gift basket filled with their marinara sauce, vinaigrette salad dressing, honey and maple syrup. The gift sets at Red Bee Honey look amazing. They also offer a Honey Of The Month Club and Tasting Party boxes. Of course, another idea is to buy your favorite local food products from a variety of vendors and make your own gift basket. I did this for some people on my list this year. What are the holidays without a little libation, right? This fall we stumbled upon a new local entry to the spirits world: Onyx Spirits Co. out of Manchester, CT. Their first release, Onyx Moonshine, is the first moonshine to be produced in the state since prohibition. It's produced in small batches from a secret recipe. I found it to be clean and pretty darn smooth. It's sold in stores all around the state. You can find out who has it near you on their website. We found our bottle at Fairgrounds Wines & Spirits in Danbury, CT. The husband and I have been members of CT NOFA for many years now. Well, last year my aunt renewed our membership as our Christmas gift. I really, really love this idea. Give the gift of membership and help promote the local, organic food system. NOFA has chapters in Connecticut, Massachusetts, New Hampshire, New Jersey, New York, Rhode Island and Vermont. I'm a sucker for cookbooks, both in digital and good old fashioned print form. This year my top locavore pick is Connecticut Farmer & Feast by Emily Brooks. It not only contains recipes but also profiles of local farmers. Plus, Emily is having a holiday special for the book: Buy 10 or more copies and receive a 50% discount and FREE SHIPPING. Time for some shameless self-promotion. Help spread the local food love. Check out the my web store with T-shirts, bags, magnets, stamps and more. This month receive 15% OFF all orders and FREE SHIPPING on orders over $50! Use Code: DECDELIGHT15. Well, if this year's list isn't leaving you inspired, feel free to review my suggestions from 2010 and 2009. What are your delicious gift giving ideas? Please feel free to leave a comment with some of your local food favorites! Nice job. It's cool that you have a gift guide for the really lazy people. I mean, we're not lazy, but let's say we just didn't know what to get. ;) Also, we were at Stamford Museum and Nature Center and we noticed a honey that's made by a guy who lives in Springdale with us. How cool! Heheh this is a nice list. The Onyx spirit should be good with a lot of history. Thanks for the thumbs up. Very cool about the honey!